Updating an older home can be a balancing act - maintaining character while modernizing the look. In this recent full interior painting project, Blue Door Painting took an outdated and worn two-story home in River Forest and transformed it into an alluring and inviting space. Though the exterior was unassuming, the interior of this home was working with a mixture of everything from beige to yellow, green to grey. This client worked with a professional interior designer to streamline each space’s color scheme to be from the same palette. To achieve this interior continuity, we painted all the walls, trim, ceilings, bathrooms and even doors and closets with Benjamin Moore paint. Starting at the front of the home, we knew immediately that the fireplace should be a focal point. This old wooden fixture had so much potential; instead of restaining, the designer selected a monochrome mix of graphite and white. Painted fireplace facades can bring a room together and give a decorator more flexibility. Moving deeper into the home, the modern theme was carried through with grey variants. This, coupled with bright white trim, gave each room its own signature contrast while tying it together with the rest of the house. Everything in this home from the master bedroom to the nursery was given a facelift from floor to ceiling. To minimize the look of the electrical outlets, the designer decided to paint the outlet covers the same color as the wall, creating an uninterrupted flow so the white trim could pop against the darker grey. We completely transformed the old, worn staircase into a beautiful high point in the entryway. 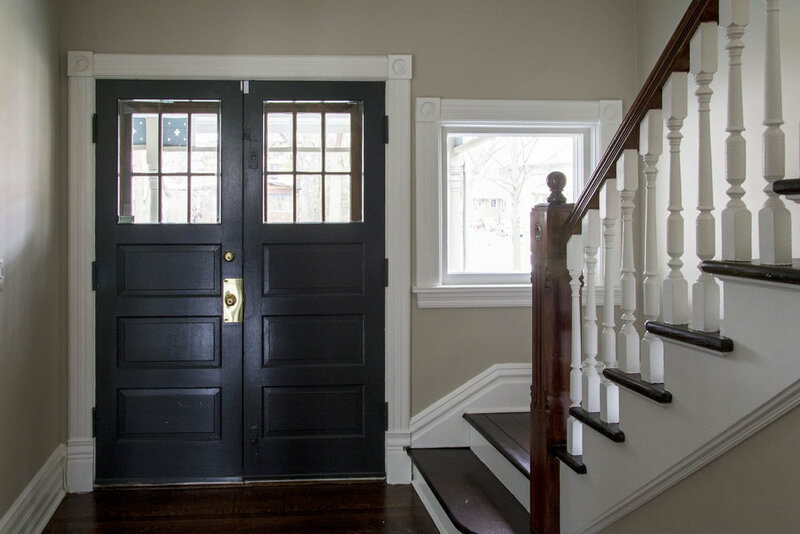 In keeping with the modern light vs. dark palette, we brightened the base and darkened the face of each stair. The balance is particularly noticeable against the backdrop of a neutral pewter on the hallway wall. Most people stick with wood grain or white doors, but the homeowner wanted to complete the deep contrast; the kitchen entries and the front door were painted to match the fireplace and framed with bright, illuminating white trim. 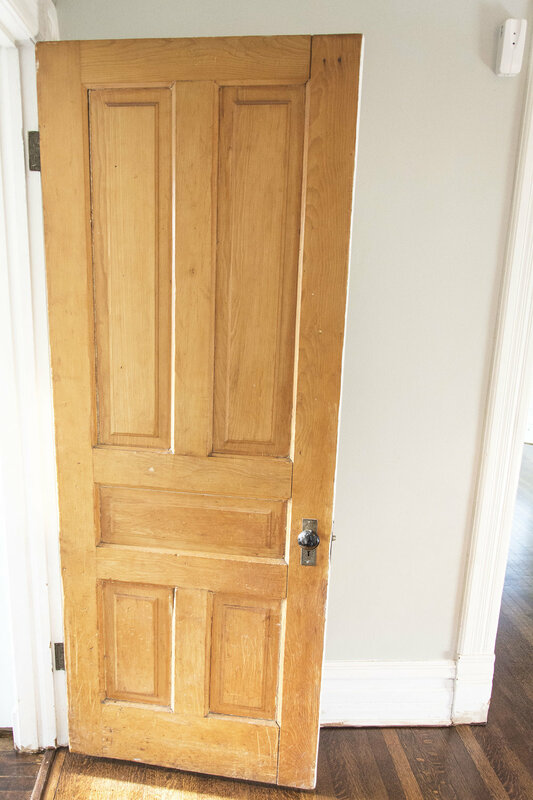 Blue Door Painting is a fully insured and vastly experienced interior painter. 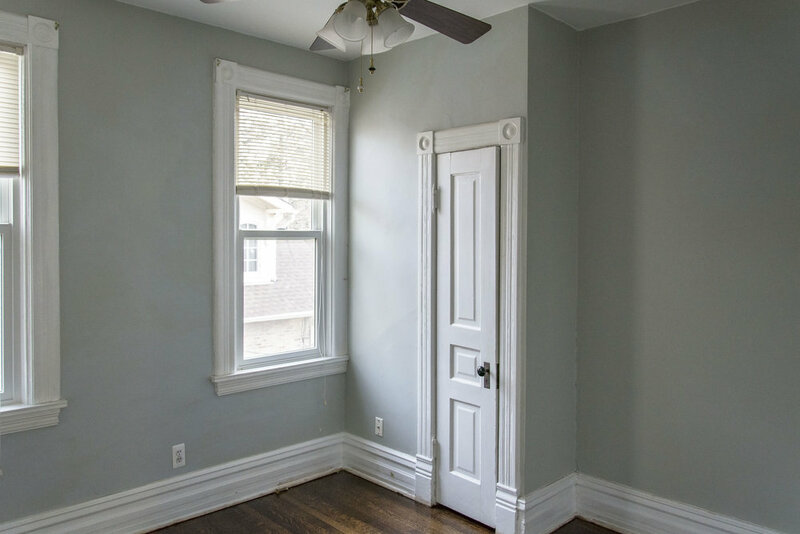 Contact Blue Door Painting today to get a free estimate for any painting project – we are fast, professional and affordable! We hope you enjoyed this installment of our monthly Job of the Month Series. Stay tuned for more Chicagoland painting projects by Blue Door Painting! Follow us on Instagram for daily inspirations and read our 5 STAR reviews on Yelp, Angie’s List or Houzz.